Cars at the Texas Motor Speedway weekend in November. Texas Motor Speedway president Eddie Gossage is more territorial than a cat claiming a cardboard box, and hoo boy, people are really stepping on this cat’s tail this week. But do you know what else cats have? They have claws. Gossage’s have come right on out, and it is not pretty. It’s also not going to do much, since this same thing happened a few years ago. Formula One announced its preliminary 2019 race schedule on Friday, and the plans are for the U.S. Grand Prix in Austin to be later than usual next year. 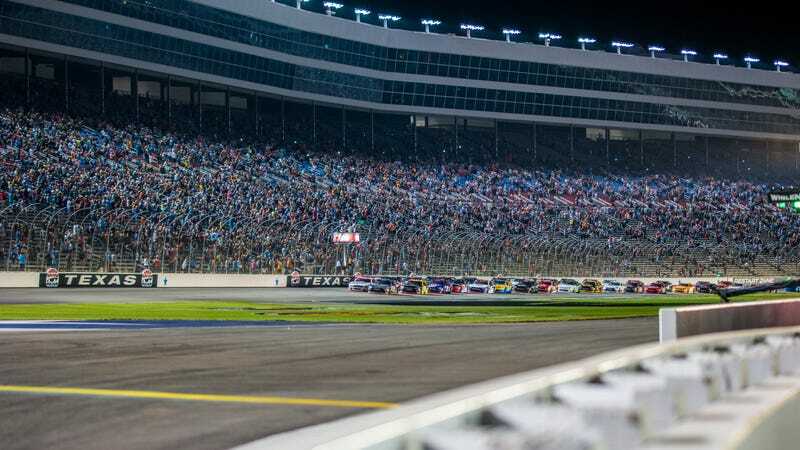 The race will be Sunday, Nov. 3, 2019, which happens to be the same day as the Monster Energy NASCAR Cup Series race at Texas Motor Speedway next year. This happened in 2014, and Gossage wasn’t happy then, either. “Shame on Formula 1 for doing this to the fans. Fans have recognized this as the NASCAR date on this weekend since its inception long before Circuit of the Americas was built,” Gossage said in a statement. But that is certainly not all, folks. Gossage is on Twitter, the worst place to go when you have more than approximately 12 followers and you’re mad about something, reminding everyone that F1 does not care and everything is bad. It makes sense to be mad about a double booking of two major motorsports events in the same state. It really does. But when you’re mad, the best advice is to avoid Tweeting Through It, especially when F1 is the organization that set the date. Angry tweets show that one side is more concerned than the other. Plus, just let the paying customers tweet for you. Because, honestly, F1 isn’t going to tweet anybody back. Those folks are still new to the internet.